This article is for primaERP Account owners and Account administrator. We believe that one of the key factors for the success of an enterprise lies in cooperation and teamwork. Overview of the status of your projects. Easy Generation of reports per user. Begin tracking time in a team by inviting your co-workers. Click on “Settings” which is located at the top right side of the main menu. Select “Users” on the sub-menu. You will see the list of users in your primaERP account. Note that you can have 3 users for free. If you need more users, you can extend your licence at any time. Click on the "+ USER” button. Fill in the name and e-mail of the person you wish to invite. The person you have invited will receive an e-mail with the activation link and the address of your primaERP TIME TRACKING account. primaERP Time Tracking - smart time tracking app for individuals and/or teams, so you can see how much time you spend on your client, project, task and/or activity. primaERP Billing - to manage and edit pricing, account for extra expenses and, the most important part, issue customized bills. You can decide which user is going to have access to which module. Just click on Settings (toothed wheel icon) > Accesses and tick the boxes of modules that yoou want each user to have. If you run out of the licences you have available, you can any time buy more licences by clicking on the shopping cart icon. 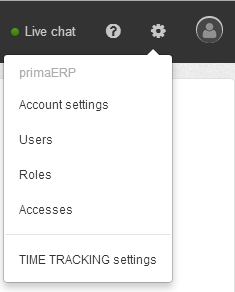 This feature allows you to define roles in your primaERP account. By default, the person who created the account will be the account owner, who can give different access rights to his team members. The access rights are assigned based on the roles set in the application, where each role has its own competencies. The competencies level differs in accessing important features like clients, projects, prices, etc. This is an advanced feature which allows only the account owner and administrator to assign the access rights to other users. Go to Settings (toothed wheel icon) > Users > Select a user > Assigned roles tab > tick the roles you want to add. Note: You will only see roles connected to modules that the user already has, so if the role you want to use is missing, add the user access to the corresponding module first - see previous topic Manage user accesses to modules. Account owner – The owner of the account has full control over the account: he can manage projects, clients, activities and account settings and controls the deactivation of the account and the ownership transfer. Account administrator – The administrator has basic control over the account: manages projects, clients, activities and account settings. He can also deactivate/delete any user and even himself. He can also see the whole team's time records. Time Tracking Project manager- As a project manager, the user will be able to create new projects and manage them. He can add members to the project and edit all related time records within the project. Time Tracking Advanced user – A user with this role can see the prices within the application, as well as he can set, edit and delete the custom prices in his own time records. Time Tracking user – A user with this (default) role has basic access rights in the TIME TRACKING application; he can create, edit and delete only its own time records. 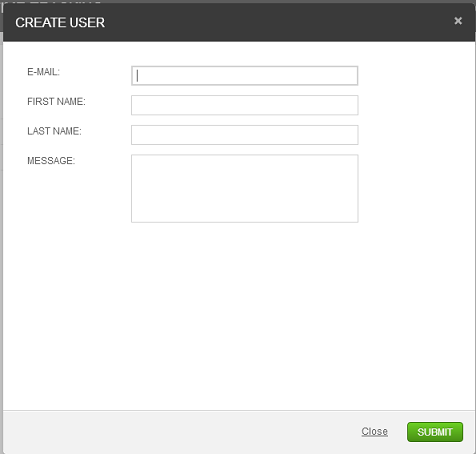 Billing user - A user with this role has basic access rights in the BILLING application. He can create, edit and delete hourly rates and bills, based on the data registered in the TIME TRACKING application. Attendance user - A user with this (default) role can clock in/out and track his breaks, as well as access the timesheet to just check it, print it or send it via email for approval. This user can cancel only the current running stopwatch. Attendance Advanced user - A user with this role can also track his/her attendance and edit a running stopwatch, as well as edit previous time records via the detailed overview of the day or via the timesheet. Attendance admin - A user with this role can do all of the above mentioned Attendance activities, plus see and edit the timesheets of all of the users that have access to attendance. He can also access the Attendance settings, where he can manage the project and activities related to attendance. When a user is first invited to the primaERP application, he has to contact the account owner or admin in order to have his access and role assigned, if this wasn't done already. Do you want to learn more about Adding member to yout projects, Removing members from your projects or the Difference between “Deleting” and “Deactivating” users? Check the article about Teamwork. Do you want to know how to adjust Attendance roles and activities to your team? How to define which activities count as work or break and how to add icons to activities?